Going by the official page, the Galaxy series comes in two variants - the Galaxy A6 and the slightly high-end Galaxy A6+, with both flaunting Super AMOLED Infinity Displays and aspect ratio of 18.5:9. Samsung has finally unveiled its latest Galaxy A6 series. Going by the official page, the Galaxy series comes in two variants - the Galaxy A6 and the slightly high-end Galaxy A6+, with both flaunting Super AMOLED Infinity Displays and aspect ratio of 18.5:9. 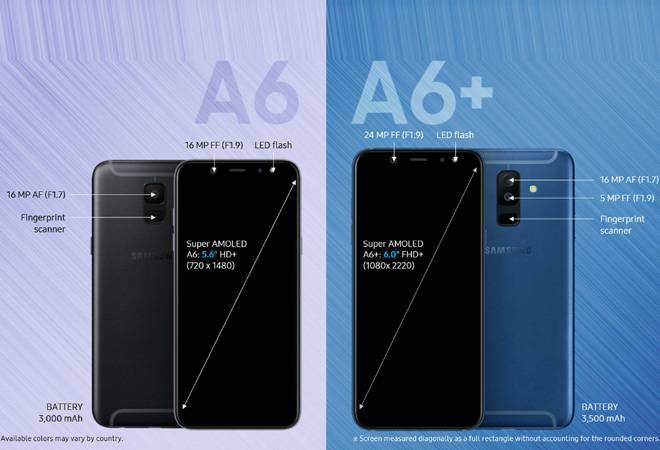 The A6 will have a 5.6-inch Super AMOLED HD+ screen display while the A6+ will feature a 6-inch Super AMOLED Full HD+ screen. The Samsung Galaxy A6 will have a 1.6GHz octa-core processor with 3GB RAM, storage of 32GB(expandable up to 256GB) whereas the Galaxy A6+ will have a 1.8GHz octa-core processor with 4GB RAM, storage of 32GB (expandable up to 400GB). The A6 and the A6+ will have 3000mAh and 3500mAh batteries respectively. The Samsung Galaxy A6 comes with a 16megapixel (f/1.7 aperture) main camera while the front camera is a 16megapixel sensor (f/1.9 aperture) with LED flash. The Galaxy A6+ has gone a notch higher and boasts a 16megapixel main camera with f/1.7 aperture and 5megapixel sensor with f/1.9 aperture coupled with an LED flash. The front camera comes with a 24megapixel camera with f/1.9 aperture. The Samsung Galaxy A6 is likely to be priced in the range of Rs 24,054 - Rs 27,262 while the Galaxy A6+ is expected to be priced somewhere between Rs 28,868 - Rs 32,073.